Racing Background: Dragracing, motocross racing, and stock car racing. 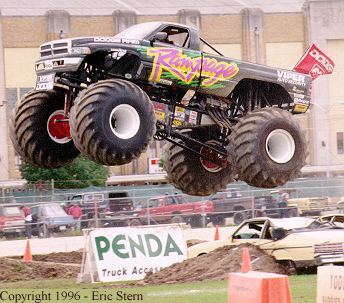 Truck Facts: 1995 Dodge Ram. 572ci Chrysler Hemi with 1500hp. 3 speed Lenco transmission, ZF axles, 66x43x25 Goodyear custom cut tires. 3 months build time at over $ 125,000.00 total cost. This truck was built by Fred Shafer and sold to Richard and Shirley in mid 1997. Paul Shafer purchased the truck from the Pattersons in 2002. Sponsors: M-30 Hand Cleaner, Li'l Computer Shoppe, Auto Ventshade. Outstanding Achievements: This truck, formerly driven by Todd Frolik finished 4th in the 1996 PENDA points series. Jeff began driving in 1999 and has obtained his Class A MTRA drivers license.